The nationwide egg recall has most everyone on alert but at least one Bay Area company is benefitting from the salmonella scare recall. Olivera Egg Farm in San Jose raises and produces eggs locally. It's been around since the 1950s and has been a staple for many families and local businesses. The owner of the egg farm says they have seen increased business since the salmonella scare because people know the eggs come from California. "They tend to feel safer because they know they're produced locally," Edward Olivera said. The best way to ensure your eggs are safe to eat is to make sure they're stored in 45 degrees or lower temperature or cooked to 140 degrees or higher. Health officials say liquid eggs are also safe to eat because they are pasteurized. During the process, the eggs are heated to a specific temperature then cooled immediately in order to cut down on any microbes in the food. Here's a link where you can find out more about where to buy pasteurized shell eggs. 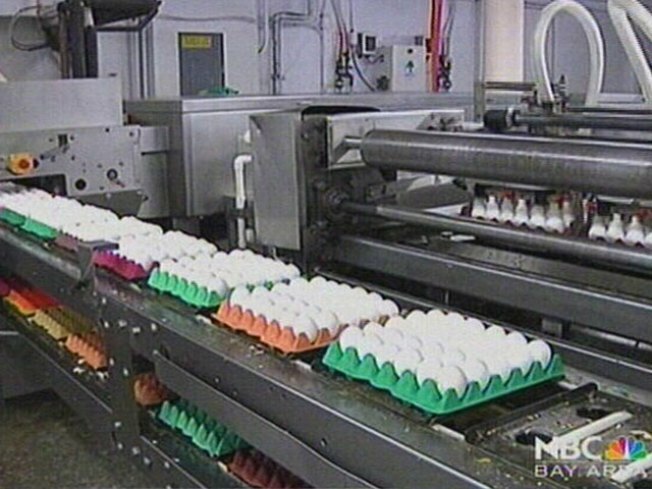 Half a billion eggs all from farms in Iowa are now part of the recall. To give you an idea of that amount, just imagine -- that's a little more than two egg cartons for each person living in Oakland, San Jose and San Francisco. The government is now investigating why the farms in Iowa were allowed to keep operating after multiple red flags were raised over the last two decades over their production.